Guillotines and cutters need to be fast and reliable without compromising safety. 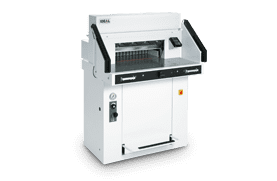 We stock the best manual and electric guillotines from industry leaders, so you can get your prints to exactly the right size. We can help you understand the guillotine features you need for the goal you want to achieve. Our guillotines and cutters come from the best German and Japanese engineers at Ideal and Uchida respectively. We can help you with ongoing product and technical support with your guillotines and cutters. Along with our superior customer service, our guillotines and cutters are competitively priced. 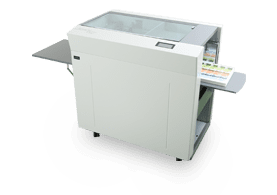 The AeroCut series is a revolutionary print finishing machine capable of a huge range of functions, including cutting, slitting, perforating, folding, and more. The Ideal range of electric guillotines includes state of the art safety features and precision cutting. They have set the industry standard for quality and safety. 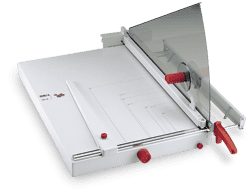 Ideal manual guillotines provide simple, safe, and effective media cutting for print rooms, schools, and small businesses. Need help choosing the right product for your business? Our team is always happy to help. 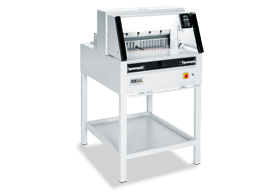 Choosing between cutters, electric guillotines, and manual guillotines will come down to the features you need for your business. The Uchida AeroCut Series has the broadest range of cutting options while the Ideal range of electric guillotines are perfect for cutting large volumes of prints to the exact size you need. Does it provide operational safety? All the guillotines and cutters we supply include industry leading safety features. Operator safety is an integral part of the design of our products, and it's an essential consideration when you purchase a new machine. You can rest assured that all our products are built with the utmost safety standards. Is it the right size for the printing you do? Your guillotine or cutter needs to be able to handle the size and volume of your printing. Tell us a bit about your operation, and we can help you choose a machine that will suit your needs. Need help choosing a guillotine or cutter? We can help. Let us know what you want to achieve with your guillotine or cutter, and we can give you advice on your options.